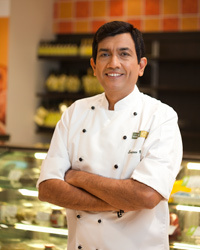 Sanjeev Kapoor, India's biggest celebrity chef, is expanding his culinary empire to America. F&W previews his new cookbook. It's time for Americans to finally learn about India's first and biggest celebrity chef, Sanjeev Kapoor. In India, a country where cooking has long been considered a menial task and even middle-class families rely heavily on servants to prepare meals, Kapoor has almost single-handedly made spending time in the kitchen seem like fun. With a daily television show that has 500 million viewers in 120 countries, as well as more than 140 cookbooks and over 20 restaurants to his nameplus his own TV station in the makingKapoor has a huge following of housewives, their mothers-in-law and even their husbands. Why? As he says, "I understand what people want." Now Kapoor is publishing his first cookbook in America, How to Cook Indian. 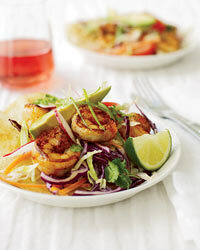 Among the 500 recipes are many regional dishes that reflect his interest in healthy eating, like a Goan-inspired shrimp simmered with garlic, ginger and a touch of coconut. Here, F&W offers a preview. "I try to put to rest the myth that Indian food has to be elaborately prepared," Kapoor says. "Once you have the basic spices, it's just a matter of tossing them in your pan." Aromatics: Start the chickpeas in spicy tomato gravy by making a paste of fresh ginger, garlic and jalapeños. Spices: Sauté the ginger-garlic paste with fragrant spices like cumin. Herbs: Add chickpeas and tomatoes, simmer, then garnish the dish with cilantro. How to Cook Indian compiles the chef's top 500 recipes from his more than 140 (!) cookbooks. 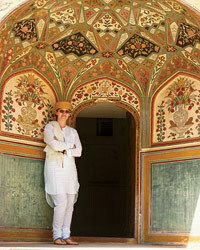 A highlight: the chapter on northern India's Chinese-inflected cuisine.